We love our little corner of Hackney here at Lozi, but every once in a while venturing away from our East London hangouts gives us invaluable inspiration. 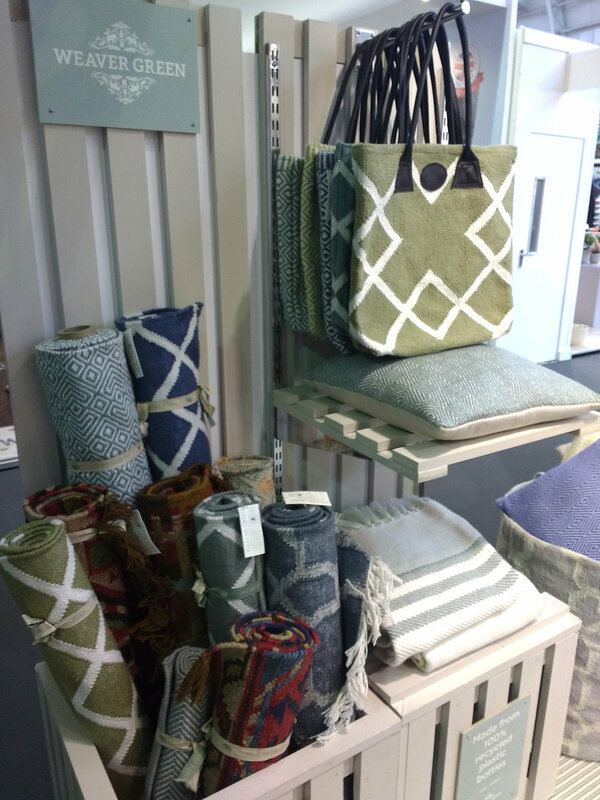 Top Drawer is one of London's best and most diverse lifestyle and design shows, catering for the Home, Gift and Craft trade. Held at the Kensignton Olympia (a long way away from Hackney Road!) it showcases some of the most interesting and versatile new designers out there, with groundbreaking new craft techniques and refined taste, as well as some new products from well known brands. Luks is a brand after Lozi’s own heart. Championing small production with a focus on ethical and sustainable manufacturing, Luk’s “Buy less, choose well” ethos is beautifully refreshing and mirrors Lozi’s made-to-measure/made-to-order approach to furniture production. Their lifestyle and home textiles are woven in Turkey from locally grown cotton, supporting master weavers and their ateliers and assuring these century old skills are not lost to mass production. Their minimalistic yet homely designs, in clean and peaceful natural hues with delicate woven patterns, will compliment any modern home. They offer a wide range of products, from traditional multifunctional Turkish bath towels known as Peshtemals to cushions, scarves and baby blankets. Sevak Zargarian’s stunning ceramics instantly caught our eye, reminding us of one of Lozi’s long time collaborators, Smile Plastics. Handmade in his garden studio, each piece has shards of parian, a type of porcelain, melded into the clay. These shards are only unearthed once the piece has been sanded down after firing. 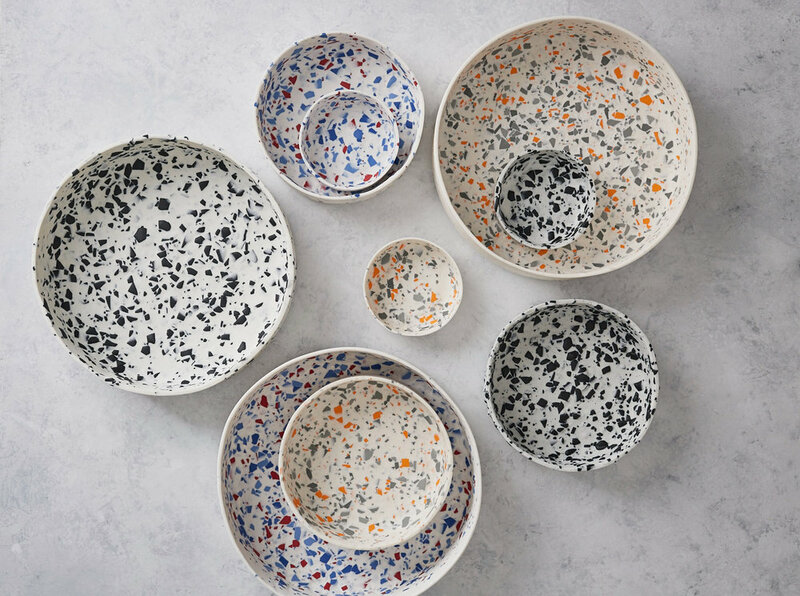 This collection found inspiration in the material properties of ceramics, particularly a material called grog which is made by grounding down unused fired pieces of clay into a fine sand. Grog is then added to unfired clay to strengthen and texturize it before it is put in the kiln. Zargarian decided to start experimenting with scaling up and colouring pieces of grog whilst at university and several years later his stunning "Unearthed" collection came to life. Difficulties arose in production, as the coloured pieces of fired clay shrink at a different rate to the wet white clay. After years of experimentation and many errors, Zargarian finessed a technique allowing him to create these terazzo style pieces without any cracks forming during firing. His process aims to be as low waste as possible. He creates all his coloured shards from scratch and, like Lozi with our £9.99 collection, repurposes his waste materials. Any unsellable fired clay gets ground down back into grog for use in future designs. Sevak Zargarian stand at Top Drawer. Any scented candle aficionado will know of True Grace candles. Elegant and beautifully scented, their tasteful stand was hard to miss. 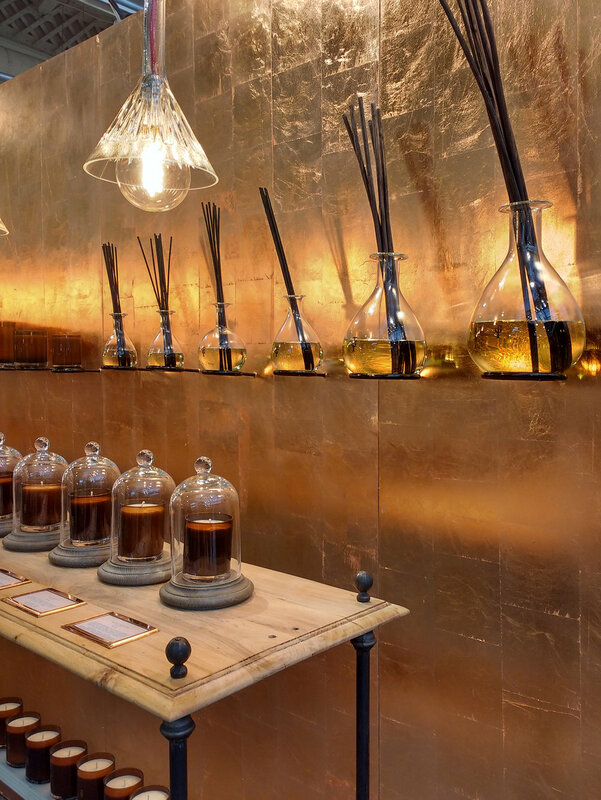 They launched 5 new fragrances at this edition of Top Drawer but their main attraction was a beautiful, opulent and rich copper and brass installation they created as a showcase for their soon to launch Burlington Collection. 27 years in the making and inspired by the Burlington Arcade in Central London where they opened their first London store, this collection celebrates the honesty of good quality materials and the beauty of shape and form. True Grace also take sustainability seriously. They commit to making responsible raw material choices and, whenever possible, use naturally derived ingredients from renewable resources, and all their packaging is recyclable. Copper and glass installation for previews of the Burlington Collection. Collection of coloured candleswith drawers stocking scent sample packs. Hand made in East London and stocked across the UK, Promises Promises was born in 2014, following designer Victoria Myatt's 8-year stint at a luxury accessories label. The name Promises Promises alludes to the promises we all make to ourselves, from ‘I’m going to be an astronaut’ to 'I’m going to go for a run tonight’, and the optimism and hope this represents in our lives. Launched in October 2016, the ‘Structure’ collection is inspired by revealing the hidden structures that make up the world around us. The shapes used in the collection derive from the insides of cells and the skeletons of buildings; apparently solid, but created by a matrix of structure and space. Made from two tone stones created using a composite similar to Jesmonite, this jewellery collection was truly unique. Ombre effect stone is layered with laser cut metal pieces before being finished by hand, creating distinct pieces with a subtle yet striking look to them. Another stunning textile designer who caught our eye is Weaver Green, whose entire collection is made from recycled plastic bottles. Cleverly woven to look and feel like wool, each rug is made from between 100 and 750 small plastic water bottles, making them machine washable, stain resistant and great for pet owners. Inspired by makeshift fishing ropes made from bottles they saw while travelling through Asia, founders Tasha and Barney spent 7 years perfecting their techniques for spinning discarded water bottles into soft yarn. Their rugs are woven in Europe, Scandinavia and Asia, with independent checks assuring all their workers are paid and treated fairly. Elegant soft colours and delicate light geometric patterns grace their pieces, making them the perfect match for a Lozi design! Hand crafted in small batches in their workshops in Edinburgh, Coco Chocolatiers blend taste and art in their stunningly presented artisan chocolate bars. Their small team of artisan chocolatiers have free rein to create unique flavour combination, coming up with such unusual flavours as a vegan haggis spice dark chocolate bar and a gin and tonic flavour with juniper oil. Their luxury chocolate bars are made from the world’s finest South American cocoa and are wrapped in beautiful individual paper designed by hand picked artists. They aim to share their love of chocolate with the world, running a chocolate school where you can learn to make your own chocolates, as well as a tasting evening to help develop an understanding of what makes quality chocolate. One of Coco Chocolatier's beautiful 12 bar boxes. Green Pioneer: a distribution comany selling design led styli, ethical and sustainable products accross Europe. Margo Selby: Beautiful and dramatic woven textiles, in deep hues and geometric patterns. Teal: Fun and modern bags, made from recycled leather and neoprene, in bright and vivid colours. Serax: Modern and minimal ceramics, in deep warm earth tones. Stelton: elegant and sophisticated homewares. Teal's Collection of brightly coloured bags. Serax's warm and modern ceramics. If you would like to discover Top Drawer for yourself, head over to their website https://www.topdrawer.co.uk. The next edition runs from the 9th to the 11th of September 2018 at the Kensington Olympia exhibition space.